We would like to formally welcome you to Highland Crossing Luxury Apartment Homes, located in the bustling Midwestern metropolis of Tulsa, Oklahoma. Highland Crossing Luxury Apartment Homes offers a selection of one, two, and three bedroom floor plans. 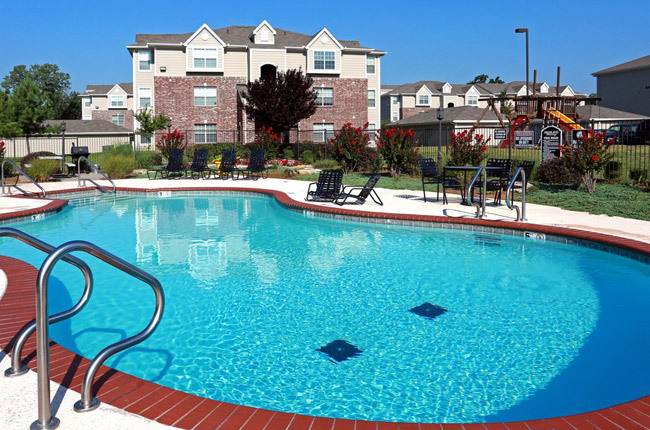 Our apartment homes are fully equipped with luxury features such as an updated kitchen with frost-free refrigerator and self-cleaning oven, a full-size washer and dryer, and expansive bathrooms. Our community amenities mimic those of a resort-style getaway: unwind beside our sparkling swimming pool, stick to your fitness goals in our state-of-the-art fitness center, or wrap up a project in our professional business center. Whatever you choose to do, we boast all of the exclusivity of a gated apartment community. Schedule your tour today, and discover maintenance-free living at Highland Crossing Luxury Apartment Homes. Highland Crossing Luxury Apartment Homes boasts a central location in Tulsa, Oklahoma, which is a mere ten minutes from the first-class dining, shopping, and entertainment opportunities of downtown. If you prefer to stay in the neighborhood, a number of restaurants align Sand Springs Highway. This boulevard of cuisine offers every type of culinary delight to satisfy your cravings: finger-licking barbecue, authentic Italian, and mouthwatering Mexican are all at your disposal. Looking to get a little shopping done? Our community features close proximity to Utica Square Shopping Center where you will find upscale shopping at retailers such as Saks Fifth Avenue, Anthropologie, Banana Republic, and William-Sonoma. As far as our neighborhood concerned, Highland Crossing Luxury Apartment Homes will provide residents with all of the convenience they desire.